Oman is an independent monarchy ruled by the Said, or Sa'id, family. It was discovered by the Portuguese in 1508, who occupied the capital city Muscat. It later reverted to local arab control, then to Persian, before returning to local control by the Saids early in the nineteenth century. It was known as Muscat and Oman until 1970 when Qabus bin Said seized power from his father on July 23rd, and changed its name to The Sultanate of Oman. The state has had close ties with the UK since the signing of a treaty of friendship in 1798. Omani Coins Oman uses ryals, baisa and annas. There are 200 baisa to the ryal, and 4 annas to the baisa. We occasionally have a small selection of Oman gold coins in stock. We show the specifications here of the most frequently held coins, followed by a list of coins most recently available. 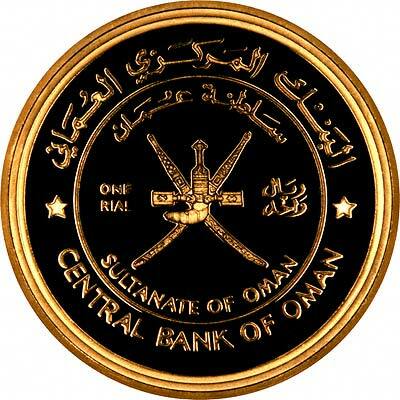 The National Emblem, the date in both the Islamic and Gregorian calendars, 1412 and 1991 respectively, and "Central Bank of Oman" in Arabic. A traditional school session consisting of a bearded teacher (a mullah?) with six children (boys), sitting cross legged under a tree, with the denomination 25 Ryals in Arabic. Obverse The National Emblem, the denomination and Sultanate of Oman and the Central Bank of Oman. 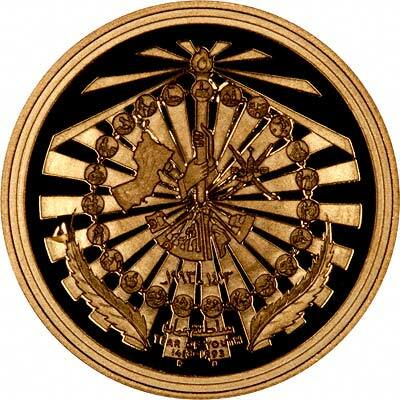 We assume the reverse is the radiant design as listed for the 1992 coin in the Krause catalogue. For some reason this coin does not appear to be listed but the weight and the description fit! Technical specifications of the most frequently encountered Oman gold coins. For silver and base metal coins of Oman, please look at our original Chard Coins website.